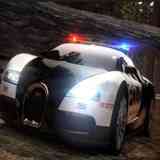 Fight crime in a police gun attached with automatic mini gun, as you race down dangerous gangs of racers. Finish various missions to unlock new cities and objectives. Expect police chases, crashes, explosions and lots of actions in this game.